Disaster Management (KZNCADM) - ACR National Crime Initiative SA (PTY)Ltd.
We are a company born out of many years of Research & Development where our Founding Directors worked tirelessly without remuneration compensation between 2011 - 2014, most days without any break 18 - 36 plus hours before having a "breather" and back to the "grindstone"
Our Founding Directors were selected due to their skills, and due diligence conducted against them, whilst they were assisting the Agricultural Sector with Both AFASA and NAFU been appointed at the time to assist in Research & Development to assist and develop Emerging Farmers. Project would benefit all Citizens, Residents and Migrants in the Country, regardless of Race or Skin Color. Our Founding Directors were grilled and tested on a daily basis for their integrity and honesty of not leaking classified information to the Press, Public, or any Corporate person / Entity that was not part of the Consortium of Vetted Persons, and only certain info was allowed to be given to the said parties accordingly. Founding Directors, trained extensively with Legal Knowledge both locally and Internationally to ensure all Legal Correspondence between ALL International Countries meet and marry up with their required law, as wells as legal documentation marrying up with our Local Partner Companies. Non Disclosures were signed by All Relevant Parties from National & Provincial Government, National & Provincial Treasury, International Investors, Local and International Companies. Relevant Appointments were also made known to the relevant stakeholders. The Rollout of the infrastructure on an unsolicited bid was to take place once Investors had finalized payment and nest phase of the Research and Development had been completed. Sadly after Marikana incident and world economic collapse, our Country was met with lack of investor confidence, where the investors pulled out. Starting Capital Investment to start rolling our of the Development was well in the excess of R100 Billion, with a 60/40 in favour of South Africa (This was for KZN Alone), then rolling out of project in other provinces with Similar adjusted budget. The project was Directly in Line with NATMAP 2050, and would have taken the country into prosperity. One of the appointments was for our Founding Director to form and run a highly advanced and strategic Disaster Management Company, tat would oversee all aspects, planning and implementation should any disaster occur, no matter if Natural / Man Made, or Acts of Terrorism or Corporate Espionage. Registering as a NPC (Non Profit Company) we felt would be the best way forward, as we had inside knowledge from R&D as to what was happening Locally and Internationally, having the experience, and knowledge, as well as been Loyal South African Citizens, and having the greater interests of the Country and Humanity at heart. 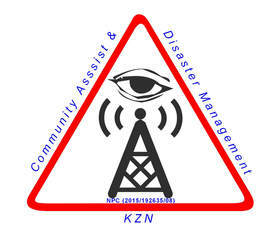 It is with such KZN Community Assist & Disaster Management was formed, and registered as a Non Profit Company. Disaster managementThe organization, planning and application of measures preparing for, responding to and recovering from disasters. Annotation: Disaster management may not completely avert or eliminate the threats; it focuses on creating and implementing preparedness and other plans to decrease the impact of disasters and “build back better”. Failure to create and apply a plan could lead to damage to life, assets and lost revenue. Emergency management is also used, sometimes interchangeably, with the term disaster management, particularly in the context of biological and technological hazards and for health emergencies. While there is a large degree of overlap, an emergency can also relate to hazardous events that do not result in the serious disruption of the functioning of a community or society. Disaster risk managementDisaster risk management is the application of disaster risk reduction policies and strategies to prevent new disaster risk, reduce existing disaster risk and manage residual risk, contributing to the strengthening of resilience and reduction of disaster losses. Annotation: Disaster risk management actions can be distinguished between prospective disaster risk management, corrective disaster risk management and compensatory disaster risk management, also called residual risk management. Prospective disaster risk management activities address and seek to avoid the development of new or increased disaster risks. They focus on addressing disaster risks that may develop in future if disaster risk reduction policies are not put in place. Examples are better land-use planning or disaster-resistant water supply systems. Corrective disaster risk management activities address and seek to remove or reduce disaster risks which are already present and which need to be managed and reduced now. Examples are the retrofitting of critical infrastructure or the relocation of exposed populations or assets. Compensatory disaster risk management activities strengthen the social and economic resilience of individuals and societies in the face of residual risk that cannot be effectively reduced. They include preparedness, response and recovery activities, but also a mix of different financing instruments, such as national contingency funds, contingent credit, insurance and reinsurance and social safety nets. Community-based disaster risk management promotes the involvement of potentially affected communities in disaster risk management at the local level. This includes community assessments of hazards, vulnerabilities and capacities, and their involvement in planning, implementation, monitoring and evaluation of local action for disaster risk reduction. Local and indigenous peoples’ approach to disaster risk management is the recognition and use of traditional, indigenous and local knowledge and practices to complement scientific knowledge in disaster risk assessments and for the planning and implementation of local disaster risk management.